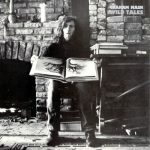 Wild Tales is the second solo studio album by British singer-songwriter Graham Nash, released on Atlantic Records in 1974. It peaked at #34 on the Billboard 200. Nash blamed its failure to chart higher in the United States on a supposed lack of support and promotion from Atlantic Records. Following the protracted breakup of Crosby, Stills, Nash & Young in late 1974 and early 1975, Nash left the label and signed a four-album contract with ABC Records as a duo with his CSNY partner David Crosby. Contrary to later reports, the darker tone of this album was not inspired by the murder of Nash’s then-girlfriend, Amy Gossage, by her brother; that tragedy happened more than a year after the release of this LP. Rather, Nash was in a somber mood in the wake of the failures of his relationships with Joni Mitchell and Rita Coolidge, and the unwillingness at the time of the other members of Crosby, Stills, Nash & Young to reunite for a new album.